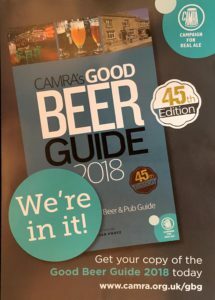 Firstly, we have just received notification that we are in the 2018 edition of CAMRA’s Good Beer Guide. Being featured in this publication recognises the hard work and dedication of our staff and management team to ensure that the ale we serve is of the highest quality and we are very pleased to be included. 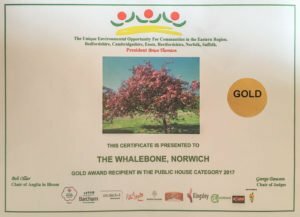 Secondly, Anglia in Bloom have presented us with a Gold Award in the Public Houses category of this year’s competition. Congratulations Steve, it is great that all of the hard work that you put in to our gardens and floral displays has been recognised in this way.